I have written previously about leading fleets as part of my commitment to the NPSI world of EVE, and along the way have been asked a couple of times how I chose the areas in which my fleet will operate on a given night. My usual answer to such questions is ‘I make it up and hope’. How I actually decide is through careful examination of websites like Dotlan and Zkillboard, and years of FCing out in the wilds, building up a mental map of the best places to get a variety of fights. Depending on the aim of your roam – you could be looking for war targets, ratters, newbies taking their first steps outside empire, your opposing faction, small gang fights, large fleet battles or even a solo titan doing something stupid – you will visit different areas of space, and this is where The Knowledge comes in. Much like a London black cab driver, a good FC running a roaming fleet must have a comprehensive knowledge of their target area of space and those adjacent to it, as well as a solid grasp of the political landscape of those areas; Knowing who is likely to batphone whom and escalate a fight, or who prefers small gangs to large fleets, is key to running an enjoyable roam for your pilots and not just giving your opposition free killmails. Now before I go on it must be made clear that lowsec space is not just Faction Warfare (FW) space – I see too many people equate one with the other. Lowsec space that is not F is found in many regions from Aridia to The Forge to Molden Heath and is home to numerous entities, all looking to make their way in the world as pirates, industrialists or even a mind bending combination of the two. Groups such as A Band Apart, The Tuskers, and Feign Disorder. Groups that are very much small gang focused, for whom fights featuring 5 to 25 pilots are the norm. Of course you find large well organised groups in such areas, who are often capable of suddenly appearing many regions over from their usual haunts if an opportunity for PvP presents itself. These groups include such entities as Snuff Box, Shadow Cartel, Suddenly Spaceships and once again, Balkan Express. These groups are often found involved in larger fights usually over a strategic asset such as a POCO or a lowsec money moon, as well as just fighting one another for the fun of it. However if an enemy is large enough they are likely to batphone each other, making life much harder for their opposition. Faction warfare lowsec is home to the four racial militias who are split into two distinct conflicts zones, one in the north west of Empire space and one to the south east. The militias themselves consist of solo pilots, small gang corps and alliances, the latter sometimes with a focus on the glory of their particular militia and the subjugation of all before them. Thanks to the use of complex’s (plex) for asserting system control, anyone roaming through this space can find engagements with particular ship classes and even gang sizes, making for a multitude of enjoyable fights for roaming gangs of any size. Yes, even the regular 200 man Ganked fleets get some great fights in FW space. From time to time, enthusiastic individuals will set up events that take part in lowsec often featuring capital ships and prizes. These tend to feature many hundreds of pilots braving lowsec to take part. Hanging around the periphery of such events is a great way to get some kills and gauge your pilots reactions to large fights, fighting against and alongside more organised groups and generally experiencing system conditions they may rarely see elsewhere. For small gangs that want to take part these events are usually terrible beyond compare, but roaming the surrounding pipes can lead to running fights with other such groups. Say nullsec to many people and they picture alliance held sov space, and permanently camped entry systems. They tend to forget that there are a few regions of nullsec – Great Wildlands, Syndicate, Curse, Outer Ring, Stain and Venal – that are in the hands of NPC factions. 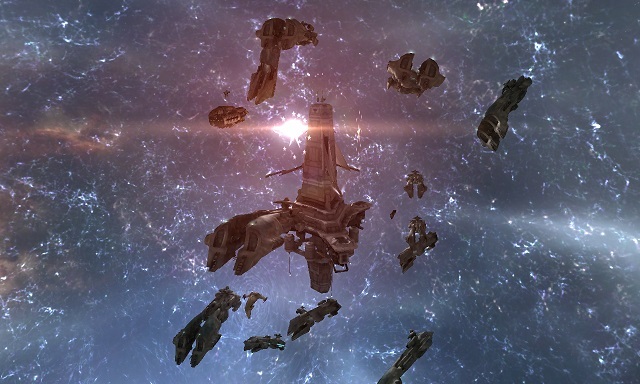 In these regions you will find a few small entities that truly do believe that small gang PvP across nullsec is flourishing, even if at times they will fleet with one another to take on interlopers. Groups like Appetite for Destruction and GROON make their respective home regions that much more interesting for visitors, big and small. Sov Nullsec Sov null makes up the vast majority of nullsec and comprises the following notable areas: The CFC held north, which is great territory for a fast moving gang to go and hunt the myriad numbers of AFKtars. Often times you can run rampant for hours before a response fleet appears. Other times, you get dunked by something vastly superior to your gang; PBLRD – CFC renter empire – held space in Delve/Querious, and the many small gangs who prey on those renters by basing out of the NPC core systems in Delve; Hero held space in the South, particularly Catch. This whole area along with Providence to its north has become a mecca for gangs of all sizes from 2 or 3 man gangs, right up to max fleets looking to take on one another or beat on someone else’s structures. More than ever before Catch and Providence are a hot bed of action, with enough ‘clean’ entry points that you can get in and out quite securely. The East and the South East are now pretty much given over to renter space by one entity or another. These renters usually have access to intel channels but oddly they die all the same. It is rare to see organised response fleets in this area, or even other roamers – it’s just too far from anywhere interesting. Wormholes I know bugger all about wormholes and I’ll happily admit that. What I know from friends who live and roam in them is that life is very interesting, often for a short time as you run into the locals and they pull out their bling ships or caps and go all ‘right hand of god’ on people. One boon for roaming gangs that has come about thanks to wormholes are the connections they allow between regions on opposing sides of the map, letting small gangs cover much greater distances in their quest for killmails, or for escaping response fleets in hostile regions. So using the sites I discussed earlier and my personal experiences across all strata of EVE over the past few years is how I decide where to roam of an evening. Dotlan will tell you exactly were ratters are clustered, the ingame map will show sov changes, high cyno numbers and even pilots docked in space, but what is key, is the experience you pick up just getting out there and leading a roam.